ZEN Rooms Nanai Soi 2 - Phuket, Thailand - Great discounted rates! 7.2 out of 10 based on 1 verified user review via Agoda. ZEN Rooms Nanai Soi 2 is perfectly located for both business and leisure guests in Phuket. The property offers a wide range of amenities and perks to ensure you have a great time. Facilities like 24-hour security, daily housekeeping, 24-hour front desk, Wi-Fi in public areas, car park are readily available for you to enjoy. Towels, linens, internet access ?ÛÒ wireless (complimentary), smoking policy ?ÛÒ non-smoking available, air conditioning can be found in selected guestrooms. The property offers various recreational opportunities. No matter what your reasons are for visiting Phuket, ZEN Rooms Nanai Soi 2 will make you feel instantly at home. 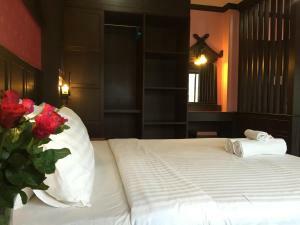 ZEN Rooms Nanai Soi 2 - Phuket classifies itself as a 3 star hotel.